US-based luxury watch maker Fossil Group is the parental company of 6 giant and topmost luxury brands like Fossil Q, Michael Kors Connected, Skagen Connected, Chaps, Emporio Armani and Misfit. And with the launch of its smart wearable line-up, the company has made its debut in the Indian. 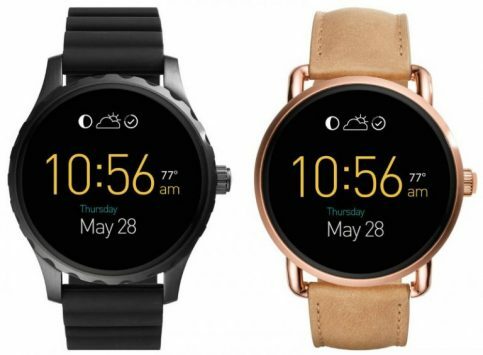 The Fossil conglomerate has launched eight smart devices including two Fossil Q smartwatches, two Misfit fitness tracker, two Skagen commodities, the Michael Kors smartwatch and the Emporio Armani wearable which accompanies a cluster of variants. As for Fossil’s own Q line-up, there are two options- the Q Wander and the Q Marshal. The Fossil Q Marshal is specifically designed for men, while the Q Wander is supposed for ladies. Both the variants are IP67 certified (water and dust resistant) and are powered by Android Wear. All of the two smartwatches are spherical in outline with 45mm in diameter and come with a variety of body styles and strap options. The Fossil’s Q Wander smartwatch features a soft curving, multi-finish case and comes with interchangeable genuine leather strap. While the Q Marshal features a rugged case along with a navy blue plated case paired with vintage-inspired leather straps. Both variants are backed by a 360mAh battery and are equipped with wireless charging capabilities. The company has also launched Michael Kors Access smartwatches featuring designs based on the Bradshaw and Dylan styles. These smartwatches are powered by Android Wear and offer activity tracking, voice activation, water resistance and wireless charging. The watches start at INR 25,995. Fossil acquired MisFit expands its portfolio with Misfit Shine 2 and Misfit Ray. Both the wearable devices are targeted at dynamic and energetic youth, and feature a modular design and a minimal refined design aesthetic that lets users track their fitness activities without sacrificing style. The wearable is priced at INR 7495. Skagen debuts with Skagen Connected, a wearable technology line. The initial collection will include the Hagen Connected hybrid smartwatches and a Skagen Connected activity tracker. Both the devices are priced between INR 14,295 and INR 15,495. Fossil has also launched Chaps hybrid smartwatch that starts from INR 9,995. The Emporio Armani has also launched connected wearable devices with Emporio Armani Connect. These weRble devices will be available in Rose Gold, Black, Gunmetal, and Stainless Steel metal finish, and are complimented by either a three-link bracelet or a leather strap. They will cost from INR 17,495 to INR 27,995.